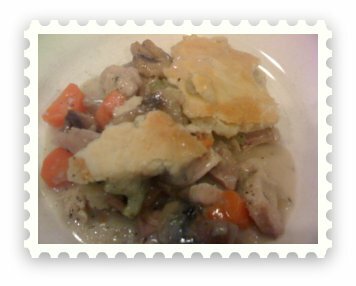 This turkey pot pie recipe is a fantastic way to use leftover turkey from your holiday meal. The turkey I used for this turkey pot pie recipe was a bird I did on my Weber with indirect heat and hickory, so there was a nice smokiness to the dish. But in all honesty, any leftover turkey or chicken will do. The recipe comes from my wife's parents, right down to the homemade pot pie crust, which is to die for. It is crisp, sweet and flaky, and most importantly, pretty easy to make. If you are trying to keep it simple, you can use ready to bake pie crusts, although I would really encourage you to give the homemade crust a try. I have created videos and web pages on how to cook beer can chicken and turkey on the Weber grill. To see how Dave makes beer can chicken, CLICK HERE. To see how Dave grills a turkey on the Weber grill, CLICK HERE. Please watch the video if you want to make the pie crust from scratch. The other option is to buy the ready made pie shells. 1 Tablespoon Herbes De Provence: If you don't have this, substitute 1 teaspoon each of rosemary, thyme and marjoram. With the sauce, you melt the butter and then mix in the flour over medium heat to create a rue. Stir until the flour dissolves. Then stir in the stock and wine. Stir for a bit. Lastly, stir in the milk. Stir over medium heat until you have a consistency that is slightly thicker than gravy. Pour filling into a cast iron pan and then pour sauce over filling. Cover with pie crust. Pierce few openings in the crust to allow steam to escape. Brush the crust with egg whites. Cook for 40 minutes in a preheated oven at 400 degrees Fahrenheit. Trust me, it is worth your time to view the video below! If you want to ask Dave a question about this recipe, CLICK HERE. If you have a great side dish recipe we would love for you to share it with us. Best side dish recipe will be getting some really cool stuff! CLICK HERE to share your recipe!